Sept. 30, 2014…….Busy start to the week, Fall is not right around the corner…its here! The fishing and the weather and the leaves are changing quickly, and all of it good. Sure, there are some things I will miss about summer or warm weather, but hey, when you live in an area like we do where we can do this 12 months out of the year its all good. Streams are low and clear, this last shot of rain was good but more is needed. 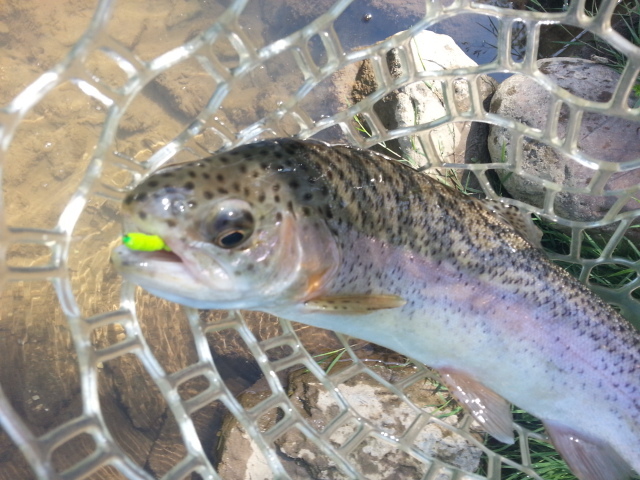 Cool nights and cooler days have made for better water temps, and temps are ideal, and most waters are seeing the first of the fall olives, some craneflies, a smattering of caddis, some flying ants, and still a decent terrestrial bite that will stay around til the frosts become regular and all the leaves have fallen to the ground. Until then though, don’t put up the beetles, ants and inchworms just yet. I landed some good fish on large terrestrials, as have clients the past week, most notable being a size 12 carpenter ant tied with foam. Yes, size 12. 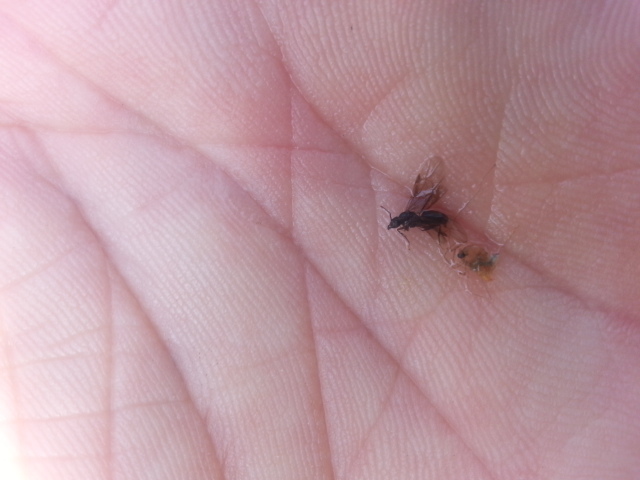 A frequent fly fishing mistake is the belief that you need to always fish small ants. Nothing could be further from the truth. I do right the opposite. On our waters, unless they are flying ants, which are very late season(right now) and usually very small- – -requiring both spot on patterns and careful presentations, I almost always use a size 12 or 14 and almost never use a smaller one. Here’s a report on the latest fishing, which was on the tailwater to our north known as the Smith River, aka “Smitty”, and one of my favorites and my home water…. I had originally scheduled a two day group trip but it didn’t pan out. I am in between our busy summer season and super busy Fall season. Have not stopped since mid July, guided a ton of trips and spent a few weeks out west, then returned to busy fishing afterward. Other than Sunday which is a day off and a day with family , have not stopped or had a ‘fishing break’ or a ‘guide’s day off’ to fish or R& D time (which I do a lot in testing and developing new techniques and fly patterns)…..so I saw a window of a few hours and hit my home water less than an hour from me…the Smith River tailwater in Central Va. I knew from decades of fishing and guiding there and from recent trips that I could find some really tough risers……stream wise wild browns to test my mettle and my new flies on. All of this proved so, just as I expected. 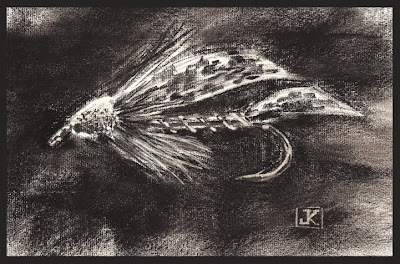 I found my friends rising in all the places I knew they would be, and the same ol’ bugs and stuff that has been happening since I first fished here in the early 1980s. Black Ants, tiny black flying ants (22-24), and scads of blue winged olives 24-26 (the ‘fall hatch’ on the Smith that brings fish up almost every late summer and fall afternoon- – -the one that frustrates folks and drives them to say bad words- – – the same one I secretly love and can’t get enough of). These fish will raise your game. 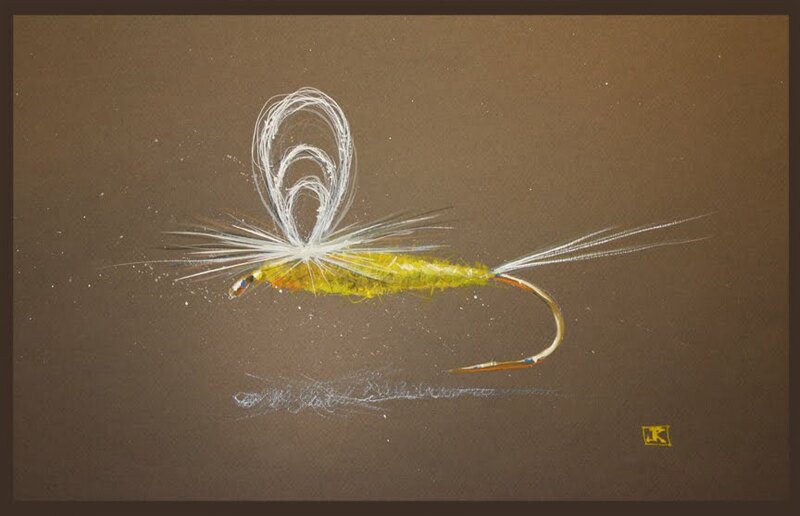 You want to make giant leaps forward in your fly fishing ability? Learn to catch Smith River fish consistently. I don’t care who you are, beginner, intermediate, or Joe Expert. These fish don’t care. 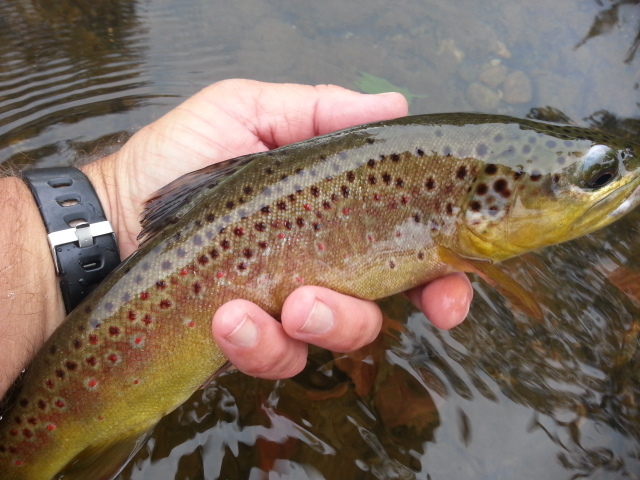 And at times they are the most technically demanding wild browns I have ever fished over. The fish of the Big Horn or Missouri River in Montana, Spring creeks in Montana, world famous Henry’s Fork in Idaho, the PhD water on Silver Creek in Idaho…..a wild Smith River brown over 12″ beats them all. And yes, I’d argue that with anyone…..expert or no. I got in the water and found rising fish just as I expected and where I expected. Tested a few ant patterns and bwos and had success with all of them. I caught all fish as they were rising, and only one took a dropper, about a 10″ brown that ate one of my Smith River chocolate zebras. 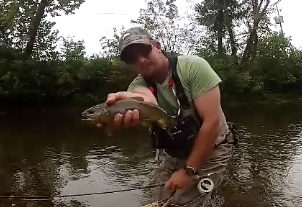 Other than that, the 15 or so I landed in 3hrs of fishing all ate dries, a mix of browns and rainbows. And it was just the sort of tough, technical, walk and stalk and fish to sippers kind of fishing I love. 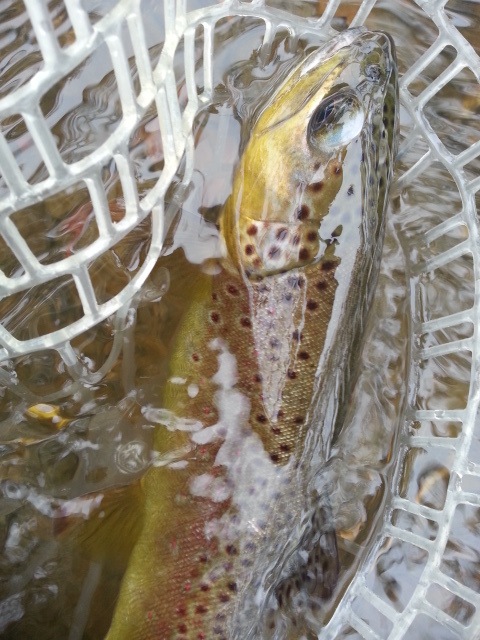 I had one stretch with 6 or 8 rising browns, all in flat skinny water, some in barely enough water to cover their backs. Picked them off , landed 5 of them, spooked one, and broke 2 others off with a hard hookset. I am seeing more fish and nicer fish than I have seen in two decades here. New regs might be having some benefit or effect, time will tell. But in any case, it was a badly needed break if only for a few hours. As a Far Bank/RIO Products Pro, I am always excited to share news and new stuff with my clients and visitors to our site. RIO products has a new Fly Line Selector app that helps anglers choose the correct fly line based upon the fishing they plan on doing and the specific rod they have. You can put in the type rod you have, and just follow the app through several specific questions….and it will take you to the lines that will work best for your rod and application. It is available for your tablet, PC, smartphone….both Apple and Android platforms supported. You can check it out here or click the logo below. 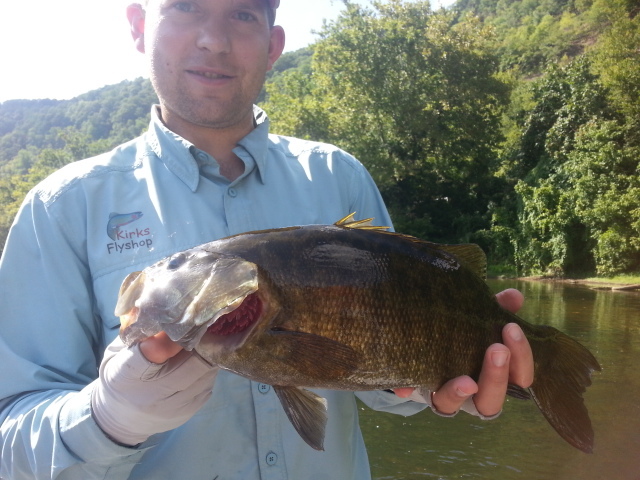 Stay tuned for more info, some great fishing reports, as we kick off our Fall season. Be sure to check out our main fly fishing site for up to date info on most everything in the area fly fishing wise….. http://www.appflyguide.com. Still Playing Catch……and Catch Up …..
Sept. 3, 2014….Been a busy week so far, its been busy since our Wyoming trips in August. No down time since then, got back in NC and practically hit the ground running. Often get questions about our ‘down time’ or ‘off season’ or when things ‘aren’t as busy’. When you fish/guide 12 months out of the year, there isn’t a time like that. Sure, some times are busier than others, but down time is a thing of the past….long gone. Time is spent catching up on all sorts of stuff that piles up when I am away…..calls, messages, flies for me/my trips, fly orders, promoting trips, updating 5 different websites on a daily or sometimes every other day basis. The big rub is that when most people are available and can talk, its 8am to 5 or 6pm. I am out way before that, and often in way past that. The times I can talk are often 4am til 6am , or after 8pm….which is hard to do when you have been up since 4am and busy all day long…and its when most people are unavailable for the most part. Its not easy….but hard to complain because business has been pretty good. And catch up is always a part of any and all of it. Had a good start to the fishing week, albeit dodging afternoon storms a bit, but its all good and that is normal for the first part of September . 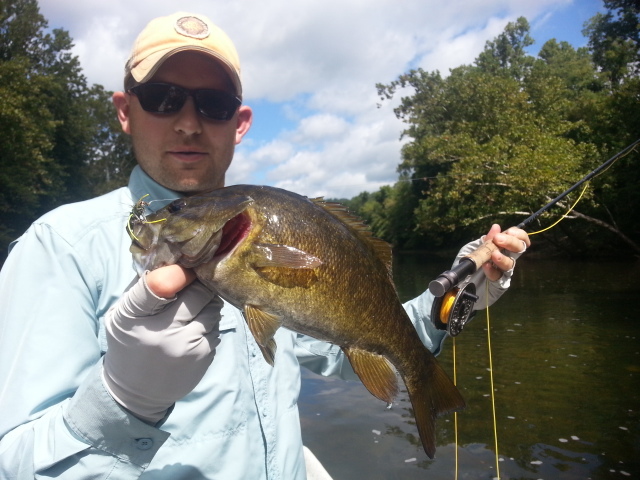 Smallmouth fishing continues to be good, the tailwaters have fished pretty well if you know where/when/and with what…..and the smaller waters that have gotten regular soakings of rain have fished okay. Definitely time for your casting ‘A’ game. That is the only rub for fishing this time of the year. 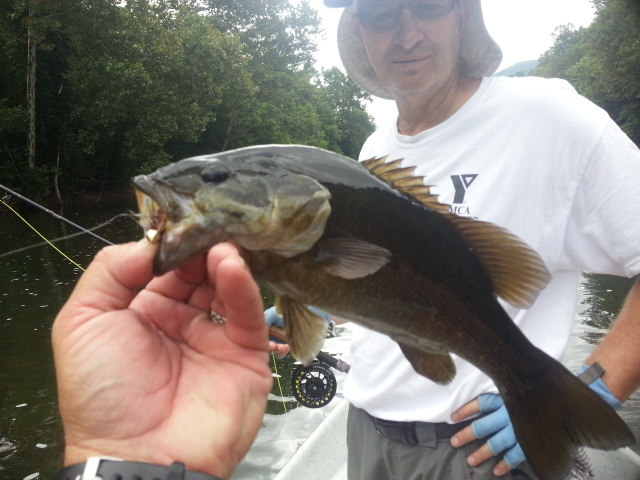 I love the walking and stalking sight fishing game on the tailwaters…..it can be fantastic. But your casting better be up to snuff. Those who cast well will repeat a great harvest and will offer themselves the chance to catch some of the largest fish of the year…fish that sometimes can’t be caught or duped any other way…than sight casting with terrestrials. 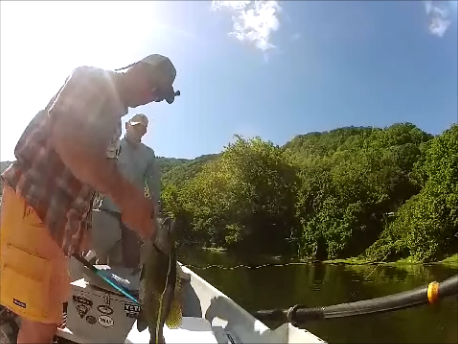 Had a great trip day before yesterday guiding Adam Norris and his dad, from Lewisville, NC, on a VA/WV New River float trip,we got a couple hrs later start but fished til dark and shared the river with a few other folks today. I guided Adam and his dad and we fished a popper flat to start, had a few on but they came unbuttoned. We then switched to streamers and things picked up, nailed a couple hogs to start, on both RLD jiggie flies and JJ Specials and JJ Jiggies….and a Jeff’s Rubberleg Squirrel Strymph. 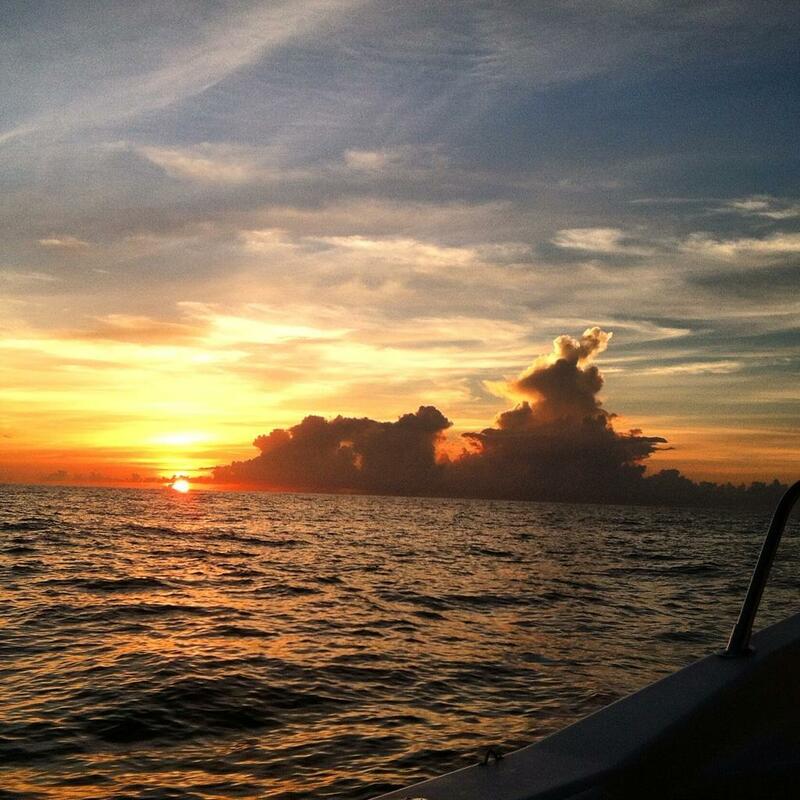 Best fish early ate a big JJ…..we caught fish here and there, not smoking them but catching enough to keep us busy. Not on fire like late last week, but that could have been due to traffic on the river over the long holiday weekend, as sometimes that can be a factor. We ate lunch, wade fished some island pockets, and caught a few more fish. Then it was in the boat again for the next half mile or so. We pulled up on a long shelf rock foam lined bank and were looking for cruisers, Adam made a cast right on the seam line and mr Big slid out from the scum line and sipped his popper like a big brown trout and then the fight was on. After a few minutes a 21.5 inch , 5 pound plus smallmouth lay in my landing net. It was epic……to land a fish like that on the surface made it even more epic, and Adam did a masterful job playing the fish. I know of many anglers who fish decades and never smash a toad like this big guy, much less with a popper and in a spot where you could see the fish slow cruise and sip the bug. We then fished our way down the bank, had some more strikes, landed a few more fish, then we hit a midstream rapid with some sinktips. We got out and waded some more, things were pretty quiet there as some kayaks went through there. We then tied poppers back on and fished them to takeout, nailing probably 25 more fish on the surface before we ended up at the takeout. We didn’t catch fish at the pace of our best day last week, but fishing was still good and the early and late popper bite and bank popper fishing midday is still great. I’d say we landed somewhere between 40 and 50 fish, from 8 to 21.5 inches. 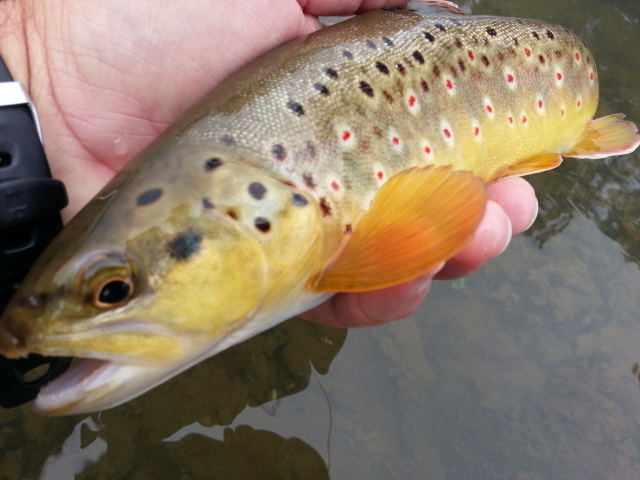 If the weather holds and is stable and the flows remain stable the fishing the remainder of the month should be epic. I plan on confirming that with rods and boat…. Adam and his dad were good fly fishermen, and a pleasure to spend the day with. Gave my boat buds, the ‘G’ brothers, my Samsung Galaxy and the GoPro a workout, and put together a new video clip below, you can view it here or ….. You can also check out the video here . With the new month having arrived, you can print out our FREE printable September Smallstream hatch chart here . September is transition month, it will hopefully be cooling off a little. Terrestrial time still, in fact its the way to fish right now on many waters. And this time of the year I do especially well with Ants….a large carpenter style ant in size 14 tied with foam is for me about as good as it gets. You might still turn fish on a beetle, but we are way beyond Jap beetle time and the fish I find much prefer ants and on small waters its inchworms. Inchworms and brown trout, or small stream trout period, go together like PB & J. Try it. Looking forward to a good end to the week, tomorrow its a Austinville Float, Friday a South Holston float with Dr Brian Donley and his son, and Saturday guiding Hayden, Jake, Charlie, and Scott Roe, and we’ll be doing a mix of tailwater fishing in the morning on the Soho and some small stream fishing on the NC side in the afternoon. Have a great one…. !